Are you looking for a fast-paced printer at a great price? The Copystar CS 2552ci MFP is the printer for you. It’s the perfect addition for any small business to use on a day to day basis for all of their printing, scanning, faxing or copying needs. Copystar wants to help to streamline the processes that you need to help make your jobs quicker and easier. You can do this with this MFP. There are always things coming up that you need to get done in a quickly so that you can move on to the next task in your day. The Copystar CS 2552ci Color MFP comes at a great price! It produces up to 25 pages per minute, whether you’re printing color or black-and-white documents. This copier has an awesome tablet-like touch screen to make it very easy to use. 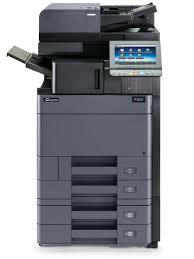 You can produce color documents at up to 1200 dpi with this copier. There are many awesome features that you can use to make tasks easier. This copier allows for a USB drive to be plugged directly into it so that you can print quickly without having to load from a computer and print. We can help you get started purchasing this MFP or finding a copier that works for your business. Just give us a call today!